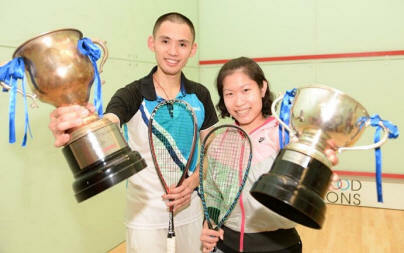 Top seeds Max Lee and Annie Au delighted the home fans at Hong Kong Squash Club as they triumphed in tough finals to make it a home double. First up Annie took on world junior champion Habiba Mohamed, and had to fight back from two-one down, finally winning after just over an hour's play to claim her 11th WSA title. Defending men's champion Max then took to the court against second seeded Indian Saurav Ghosal, and recovered from losing the first game to triumph in four after 70 minutes. Both players looked lively when they warmed up, on this final day of a weeklong tournament. This women's final then started shortly after 3pm. Overview: Habiba is clearly the stronger and taller of the two, as she sought to dominate the game early on by hitting hard and low drives into the back court; whereas Annie played more defensively to begin with, serving and playing a lot of lobs, keeping her game tight, waiting for her chance to attack. She was nimble and moved around the court well. First game: Annie made some unforced errors early on. The game quickly went to 3:3. A couple of no let calls were made against Habiba, who then raised her game and won the next few points by hitting strong deep drives into the back left hand court. Annie played her defensive games well, looked for her chance then played some good drop shots, with some winners in the nick. On a few occasions Habiba only managed to retrieve those shots by lunging into the front and doing a spectacular leg split! Score 11:7 after 9 minutes to Annie. For the next two games, both players got into their rhythm. Annie continued to play a tight game down the side walls, whilst Habiba tried to overpower her opponent. Both players wrestled over the T. Stroke was awarded to Habiba which took her to game point second game, which she won 11:8. The pace increased significantly in the third, with Habiba winning a number of kill shots to take the lead to 6:0 then winning that game 11:9. Fourth game was when Annie turned the game around and won most of her points by straight and cross court drops. Habiba started to make some unforced errors and lost 4:11; now 2 games each. Final game was heated and both players fought hard. The local supporters of Annie chanted support in Cantonese: 'play the straight shots... steady... a few more points to go...' The scores were fairly even up to 6 each when Annie pushed hard and played an attacking game, varying her serves and shots. 8:6 was a turning point when Habiba dropped into the tin and her game did not pick up again. Final score 11:8 to Annie, after 1 hour 10 minutes in total. Afterwards, Annie commented: 'I am really happy to win in 5, especially when I was playing against a younger player; it was difficult as I felt all the pressure was on us. Habiba played really well, very eager to pick up all the shots and played the ball really hard. This is my first title this year and I am very pleased. I didn't perform well last year but I can see in the last 6 months I have performed more steadily' Our congratulation to Annie. There is little to choose between these two players: they have a similar physique and both play a fairly similar style of hard-hitting squash. Saurav perhaps has a more flamboyant game play whereas Max's game is more consistent and orthodox. 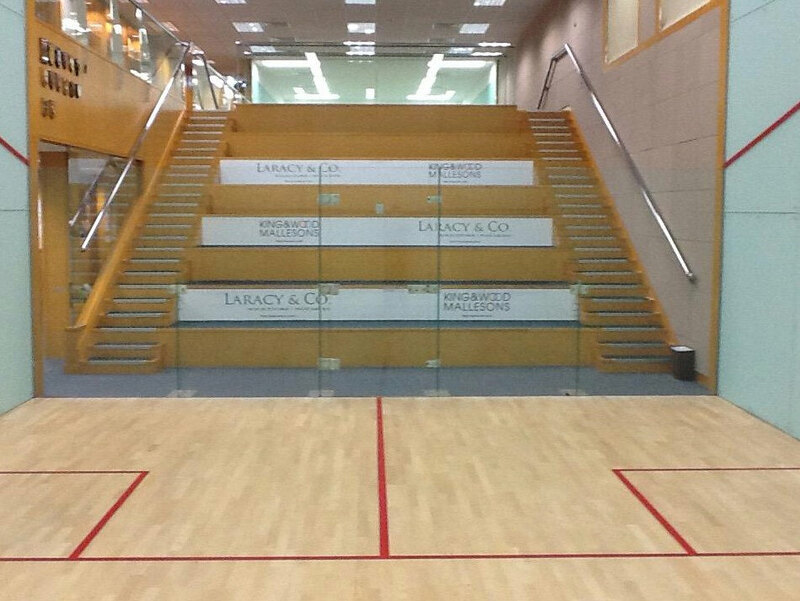 The match started at 4.20 pm on court 7 to a full house of spectators. First game, both players played deep into the back court to begin with. Max started off slowly and made some unforced errors and was down 1:3. The rallies were short for most of the game. Saurav played some beautiful drop shots in the nick. There were some difficult let calls at an important juncture when the game stayed at 5:7 for some time. Max unfortunately made more unforced errors again at 9:9 and 9:10 then lost the game. Second game, Max took the game to 8:4 quite quickly, then the players began to play some long rallies. 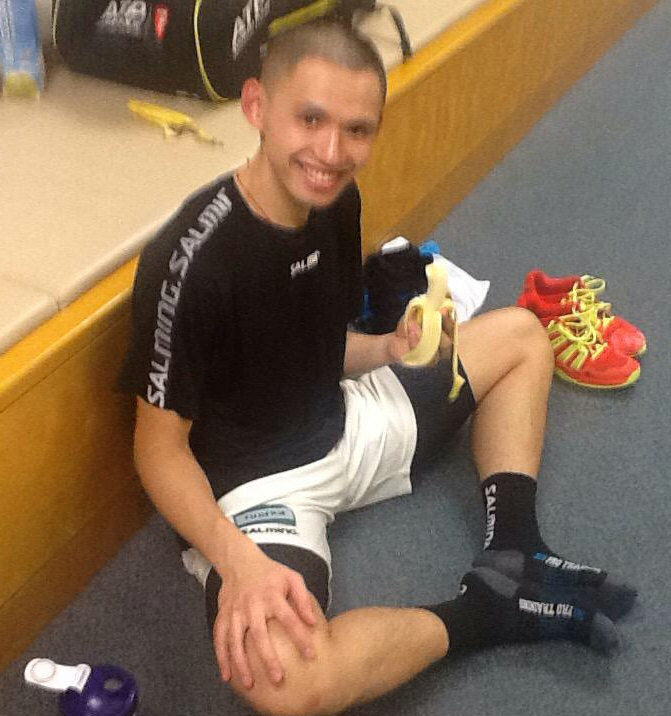 By now, Max has found his rhythm and played some winning kill shots into the mid court. He won this game 11:6. Max upped his game further in the third, working his opponent around the court. There was only one hand-out and the game finished in 8 minutes - 11:1 to Max. Clearly he was imposing more pressure and seemed to be taking control of the game; now 2:1 up. Saurav fought back in the fourth game and was up at 3:0 when Max hit the tin going for the kill. Max slowly caught up as the crowd cheered for their local top seed. Surprisingly, by 6:4 to Saurav this super fit player suddenly appeared to be slowing down. Some spectacular rallies (involving a controversial let call) took the game to 8:8. Max played a deceptive cross court and won the next point. Finally, Max had two match/tournament points - Saurav saved the first and made an unforced error in the last. 11:9 in the last game; overall play time 1 hour 12 minutes. Saurav has this to say: 'Max played well, especially in the second. Just disappointed that I lost..."
The first semi-final provided home comfort for the HK fans as top seed Annie Au came from a game down to beat Joshana Chinappa in four games. Indian supporters found something to cheer about in the first men's semi as Saurav Ghosal beat LJ Anjema in straight games. No tournament seems complete these days with an Egyptian finalist, and Habiba Mohamed provided one, the world junior champion celebrating her 16th birthday with a straight-game win over Jenny Duncalf. The final match brought another home victory as Max Lee beat Omar Abdel Meguid in straight games to ensure Hong Kong interest in both finals. ]The first Ladies semi-final at the HKFC pitted the top seed, Hong Kong's Annie Au, against theurnament's number four seed, Johanna Chinappa, of India. Chinappa had excited many spectators this week with her aggressive game based upon the twin ingredients of her hard-hitting and her fast footwork, and mixing in a good deal of skilled racket-play too. The match-up with Annie started very quickly for Chinappa as she raced into an early lead in the first game with an impressive show of skill and dexterity. A rather lethargic Au seemed to wake up and she began to find her game but it was Chinappa who sneaked through to lead, winning 11-9. The second game could have gone either way, and refereeing decisions appeared to benefit Au a good deal when it came to strokes and lets. Most of the second game was played at the rear of the court as Au gradually got to grips with the fierce pace of her opponent. In a very tight game, Au managed to save one game-ball against her before drawing level in games by winning the game 12-10, after being awarded the final point after her ball struck Chinappa's racket on its way to the front-wall. Au was now well and truly on her game, and she eased away in the third game to win 11-6 and lead by two games to one. Again, Au benefited from some strange refereeing decisions. But Chinappa wasn't finished yet, and she raced into a 4-1 lead in the fourth game, working Au very hard around the court. Au slowed the ball down with a deft array of lobs and drops in order to regain her composure, and she turned around the game by winning nine out of the next twelve points. On match-ball, Chinappa again regained her mojo, staving off several match points before yielding 9-11. So a victory for the local lady, Au, in four very tight games in 48 minutes of play as she moves now into the Ladies Final tomorrow. Both players were very complimentary afterwards about each other. Au confirmed : "The last time we played was in the HK Open in 2013 and Joshana beat me in five games, so I was expecting a very tough match. The match could have gone either way, I was pretty lucky at crucial times tonight, and especially happy with my concentration. I'm now going to watch the second semi-final before going home for some rest and some good food, and to prepare for tomorrow. 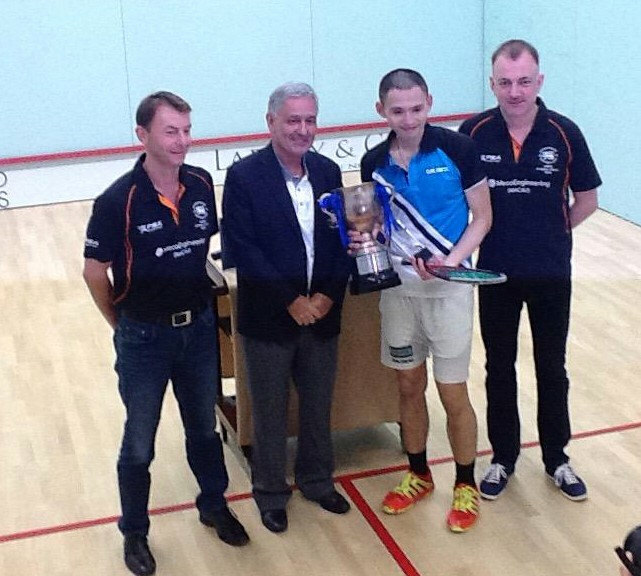 I'm very pleased to have won today with Joshana playing so well in recent months." Chinappa congratulated her opponent on her victory but couldn't contain her disease with the refereeing decisions which went against her. "I never complain about referees but tonight was awful. I was disappointed to lose the second game on a stroke (when Au's ball hit her on its way to the front wall) but it was a fair call and I'd have expected the same call, hadn't been me. However, I am happy with my squash week after beating Delia Arnold last night, and running Annie very close tonight. I'm now looking forward to a break, back home in India with my family before a couple of tournaments in Australia to look forward to in August." 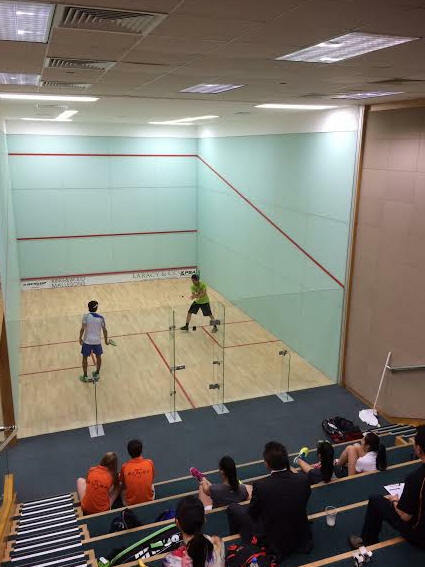 Saurav Ghosal from Kolkata, India, ranked 23 in the PSA ratings and the no 2 seed here in HK, and Laurens Jan Anjema (LJ) from the Netherlands, PSA ranked 33 and 4 in this tournament, squared up in the first men’s semi-final. The first game was fast and furious with LJ playing a power game , but to no avail against Saurav's retrieving and tight drops. Saurav raced to a 11-3 win in 5 minutes. The second game was much the same with the score being the same 11-3 in 9 minutes. In the 3rd it looked as if LJ was getting on top and led up to 9-8, but could never widen the gap by more than 2 points. Saurav continued his relentless retrieving and played 2 glorious winners to run out winning 11-9, making it 3-0 for the match. Saurav said that he had played LJ a few times on the circuit and this was the first time he had beaten him. He was aware that LJ was coming back from injury, but felt his own improvement since they last played accounted for his victory. LJ was a finalist here in Hong Kong in 2013 losing to Ali Walker. He had foot surgery at the end of last year, but was making no excuses and is happy that he is back to full fitness. He has been on the circuit for 14 years having joined it at the age of 18. He said that Saurav was improving all the time. A match of attrition - The game started off with both players playing tentative shots as the sized up each other. Habiba's powerful drives were countered by some delicate drops on return of serve and boasts by Jenny. With both players evenly matched, the game progressed to 8-8 at which point Jenny was disappointed at not being awarded a let. Her remonstrations earned her a second conduct warning, having already been cautioned earlier in the game. With her concentration disrupted, Jenny was not able to contain Habiba and lost out 11-9. The second game started with a stroke to Habiba, followed by an unforced error from Jenny but she managed to control the game to lead 6-5 with some aggressive squash. Both players appeared to get in each other's way, playing for lets which were not always forthcoming. Thereafter, Habiba seemed to have greater control of the game to serve for the game at 10-9. The game was decided by a "no let" decision going against Jenny, which clearly did not go down well with her. Her frustration was clearly evident from the strategic placement of her racquet from a distance, into the right hand rear corner of the court. The third game started with Jenny already a point down, being penalised for racquet abuse at the end of the previous game. Clearly disheartened by proceedings, Jenny did not put up much of a fight for the rest of the game and allowed Habiba to dictate the pace of the game. Habiba ran out a comfortable winner at 11-3 and the match 3-0. 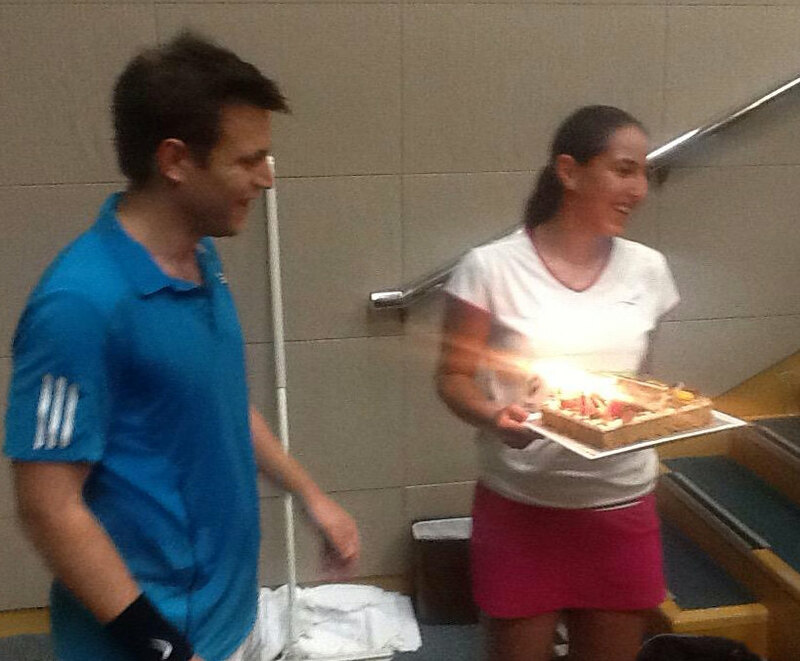 After the match a Habiba was pleasantly surprised to be presented with a cake to celebrate her birthday - a perfect end to the evening for her. Afterwards, a clearly unhappy Jenny commented "I didn't enjoy that at all today. I have played Habiba twice before and lost both times but I felt that this was the worst of the three matches. I am now looking forward to the next big event in Alexandria." Habiba was pleased to have come through "I played her before and won 3-1 so was pleased win 3-0 this time. She was nervous at the start but I played well and wanted to win. I was trying to be as right as possible and am happy to get through to the final. I have never played against Annie, one of the best players in the world and am looking forward to it tomorrow." 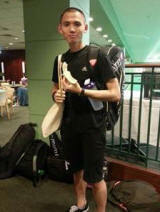 Not many players have a reach advantage over the Hong Kong number 1, Max Lee, but Omar was a clear winner on that score. That was just about the only thing going for Omar as Max was much the sharper of the two, countering Omar's powerful drives with delicate returns. Some hard fought rallies went Max's way due to unforced errors from Omar, leaving Max comfortably placed for game ball at 10-5. Omar's unorthodox shots through his legs did not serve him too well and Max took the game 11-5. Max stepped up the pace in the second game, keeping the ball tight to the walls and mixing it with drop shots that left Omar out of position. Omar was getting frustrated by calls not going his way and at 7-2, disputed a stroke call but without any luck. At 10-2 down he made no attempt to return the serve on game point and walked off the court. Omar commented that "Max was sharper and more prepared for this match than I was. I have had three very tough tournaments coming into this event and it has taken its toll. It is the end of the season and I am looking forward to a three month break"
Max talked about his strategy going into this match "I tried to surprise him from the start. He made quite a few errors and I tried to keep it simple. 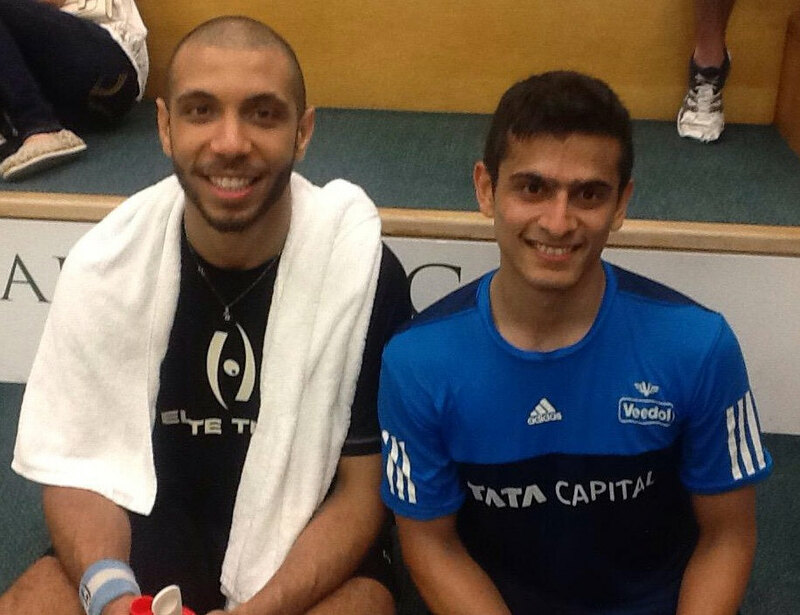 As for the final, I have played against Suarav quite a few times before and have always enjoyed playing him. The last time I lost 3-2 to him but I hope to beat him this time"
It will be the top four seeds who contest the men's semi-finals after contrasting quarter-finals wins at Hong Kong Football Club. Top seed Max Lee survived the longest match of the day as he beat Tom Richards in five, and will meet Omar Abdel Meguid for a place in the final. In the bottom half of the draw Saurav Ghosal meets LJ Anjema. In the women's draw the top seed is also from Hong Kong, and Annie Au beat compatriot Joey Chan in four close games to set up a semi-final against Joshana Chinappa. There was a big upset in the bottom half as world junior champion Habiba Mohamed beat second seed Rachael Grinham, and the young Egyptian now meets Jenny Duncalf in the semi-finals. "I played Rachael last year and I lost 3-1 so this was my second time to play her," said Habiba. "I told myself to stay relaxed and to just enjoy the game which I did." 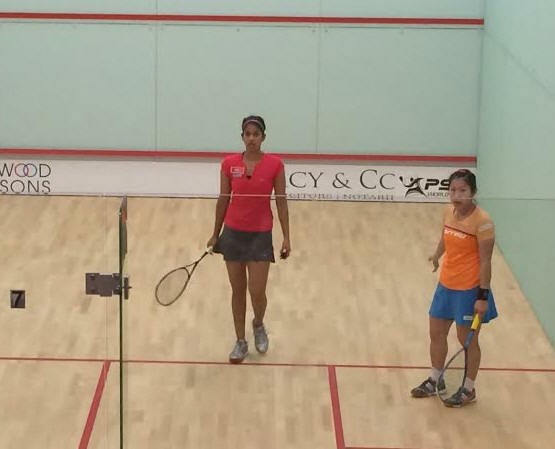 Hong Kong's finest, in ladies squash parlance, squared off against each other in the quarter final and the match lived up to expectations. Annie started off slowly and was soon 0-3 down before and error from Joey late her back into the game. Annie didn't waste the opportunity and raced to 10-3 with some clever drop shots catching Joey out of position. A front court error by Annie gave Joey a glimmer of hope and she captured the next two points with some tight to the wall squash but a clever cross court drop from Annie wrong footed Joey and closed out the game at 11-5 for Annie. The second game started with Joey showing a lot more determination, great retrieving and anticipation to cancel an early deficit and take the lead 2-1, from which she point she never let Annie get ahead. Joey made Annie work hard for every point and induced a few unforced errors during the course of the game. This do not deter Annie from playing some of her exquisite cross court drop shots, often wrong footing Joey but a poor attempted drop shot left her facing game point at 6-10. The final point of the game was hard fought with some fantastic retrieving by both players, ending in Joey taking the game 11-6 and levelling the match at one game each. The third game opened with a long rally ending in a let, which was just the break that Annie needed as she quickly capitalised on it to go 7-2 up. Annie upped the game and pressured Joey into errors on serve, catching her out of position and on occasion, completely wrong footing her. A flurry of winners from Joey allowed her to catch up to 8-6 but Annie held out and closed the game with a perfect lob; 2-1 to. Annie. Joey started the fourth game with. A deceptive cross court winner but this was countered with an easy drop for Annie to even the score at 1-1. Thereafter, Annie, having got to grips with Joey's change of pace in the second game, took the lead and never looked back. Joey continued showing great determination and aggression but Annie kept her cool and maintained her lead right through to the end to take the game 11-9 and the match 3-1. After the match, I caught up with both players and Joey was quite happy with her performance. " I am happy with my game but could not dominate the T. I upped my game in the second and it worked but Annie soon got used to it and came back to take the match. I am now off to New Zealand to play in the WSRA event there"
Annie was happy to have own and commented "I played well and kept it tight. In the second game I gave away too many volleys but was happy to win 3-1 in the end. We have played each other quite often and there have been quite a few 3-2 results because we know each other's game so well. I am looking forward to playing Joshana in the semi-finals tomorrow"
Top seed and defending home town favourite Max Lee came up against sixth seeded Tom Richards in the first of two later quarter finals Men’s matches. Defending HKFC International 2014 champion Lee came up against tough opposition in Richards as they spared to a 5-5 score before Richards found his stride and, taking the next 5 points, needed just one of his game points to see off Lee in Game 1. Game 2 was an altogether different showing. With Lee receiving serve he unapologetically took just over four minutes to dismantle Richards in an 11-0 display of both power and finesse. Richards has had a decent year, most recently beating Nicholas Mueller 3-1 in the Case Swedish Open only to lose to World number 2 Gaultier in the Quarter finals. With his wealth of experience he wasn’t about to rattle too easily and rebounded in Game 3 taking the game to Lee 5 - 1. Not to be outdone, Lee whom broke into the top 20 world ranking late in 2014, fought back finding both his lengths and nicks and reeling Richards back to a 7-7 game before the two of them went on a point for point run to 13-13 before Lee closed Richards off 15-13 in a gruelling +20 minute third game. There was no let up in game 4 - Richards managing some incredible defensive retrievals whilst Lee sought to put the contest to rest. Showing once more his determination and experience Richards played a series of high risk cross-court kills keeping his nerve and executing them to perfection. As game 4 hit the hour long mark both players took the game into another tense tie-break, the tension getting the better of Lee as he approached a bemused Richards at 13-12 to shake his hand. Both players shared a light hearted moment taking the opportunity to catch their breath before Lee served for the match. At 16-16 however Richards again dug deep to take game 4 18-16. With the game tied at 2-2 Lee was the player who best held his nerve. Whilst Richards became distracted by a few tough calls Lee strung together 10 unanswered points to reach match point and an 11 -5 finish. Speaking after the match Lee remarked “I have been feeling good throughout the tournament hitting well and quite solid - The games were free flowing games” Lee admitted it was a shame Richards lost his concentration and seemed relieved to go through to the semi’s. "I’m very disappointed to lose but I think it was a good match played at a degree of high quality.” Richards said after the match adding “He played well in important patches and is a fantastic player who’s having a very good season this year." In the other quarter final men’s match fourth seeded Laurens Jan Anjema of the Netherlands defeated the other hometown hopeful Leo Au seeded fifth in a tightly contested 68 minute match 3 - 1. After the match Leo said “some of the decisions were not as he expected it to go and he lost his concentration” but admitted that not losing his focus was something he needed to work on. In what was the tournament’s upset of the day sixth seeded Habiba Mohamed defeated second seeded Rachel Grinham in 3 games to advance to the semi-finals against third seeded Jenny Duncalf. Rachel kept it close throughout the contest matching Habiba shot for shot in game 1. Similarly in game 2 where Rachel reached game ball at 10-9 before Mohamed found the extra gear taking the final three balls and the game 12 – 10. It was always going to be a tough climb back at 2 – 0 down especially with Mohamed playing as well as she was and never letting Rachel build any kind of distance between herself and her opponent. Habiba remained focused and strung the final 5 points to see out game 3 11-7 and the match in a hard fought but comfortable game in 32 mins. After the match Habiba said " I played Rachel last year and I lost 3-1 so this was my second time to play with her. I really stayed focused and concentrated as I wanted to win this match"
Habiba also commented "I really enjoyed playing Rachel and learnt a lot from her, I told myself to stay relaxed and to just enjoy the game which I did"
Most of the seeded players made it safely through to the quarter-finals, with one upset in each of the draws as both eighth seeds were beaten. For the Men, Rex Hedrick beat Joe Lee in straight games, while on the women's side Milou van der Heijden came through a tough five-setter to upset Misaki Kobayashi. It was quite exciting to witness Hong Kong's number 1, Annie Au, compete with our beloved Hong Kong Football Club #1, Carmen Lee, and our expectations were high. Unfortunately, things got off to a poor start, as Carmen was trailing 10-0 before she got her first point and subsequently lost 11-1. Games 2 and 3 started off a bit better with Carmen leading early in both before succumbing to Annie's fine form 11-4, 11-5. It was clear from the viewing gallery that Carmen's shots were missing and she couldn't find her rhythm. Annie also had fantastic deception as she waited until the last possible second to hit some of the front court shots in totally unexpected directions. Despite a very serious demeanour on court Carmen was magnanimous in defeat and told me afterwards that it was only her second time to play Annie and this was a great chance to learn during such high level match play. As for Annie, she told me after the match that she felt that she was moving very slowly (we certainly couldn't tell in the audience, or from the score!) and she needed to move much better to have a chance to win in tomorrow's quarter final match. And she said that she loved playing on the Hong Kong Football Club’s all glass court for the first time. On paper this looked like an easy stroll for the No 1 seed ||Max Lee of Hong Kong playing against qualifier James Huang from Taiwan, who had had a tough five setter against Abdulla Mohd Al Tamimi in the previous round. Max, sporting a new go-fast hairstyle, raced off to 4-1 lead in the first game with a few delicately placed drop shots, aided by some unforced errors from James. The rallies were closely fought but Max ran out a comfortable winner in under ten minutes to take the first game 11-3. Max opened the scoring in the second game with a lovely nick into the front of the court but a string of unforced errors saw him down 2-4 in quick time. Thereafter, both players tested each other for skill and stamina, with the score level at 8-8, at which point Max's superior court skills allowed him to get to game point. After a long rally, an unforced error by James handed Max the second game 11-9. The third game started with Max playing catch-up to James, finally drawing level at 7-7. James belied his qualifier status and showed extreme skill with some delicate touches to keep Max on his toes throughout, eliciting some more unforced errors in the process. At 11-10, Max had the first of five match points but was thwarted by the tenacious James who then led 12-11 but again made an error to even the score at 12-12. 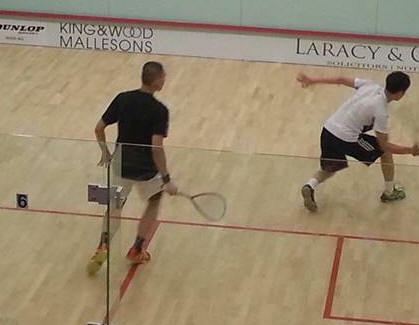 Some really exciting rallies followed, with a desperate James flinging himself all over the court to retrieve the ball and this almost paid off as he had another chance to take the game at 12-13. It was not to be though as Max kept his cool under severe pressure and held out to take the game 18-16 and the match 3-0. Afterwards Max paid tribute to his opponent for a hard fought but fair match and was looking forward to his next match. James talked about his match in the previous round and felt that he was not able to play to his full potential; however, he was pleased with the progress that he had made in the tournament. It was a clash of the Indians on court 7, with the number 2 seed, Suarav, taking on the number 10 seeded Harinder. The first game was fast and furious with long rallies and crisp shots interspersed with some delicate drops from Suarav, which saw him taking the lead at 9-2. Harinder appeared frustrated at not having a couple of let calls go his way and soon lost the first game 11-3. The second game followed the same pattern, with Harinder making more unforced errors under pressure from the more skilful Suarav and gifting him the game 11-7. Harinder was again ruffled by the umpiring in the third game and was not able to extend Suarav who took the third game comfortably at 11-5 and the match 3-0. Afterwards, Suarav said that this was the first time that the two, both good friends off the court, had played against each other in a PSA event and it was always going to be a difficult match. Harinder was disappointed that he did not play as well as he could have, but was looking forward to flying off to New Zealand, where he will be playing in three events. L'aventure s'arrête ici pour moi. Je m'incline 11-7 11-7 11-8 contre Rachel Grinham. Je fais un bon match, solide mais son expérience lui a permit de remonter au score en fin de jeu. En terme d'expérience ce tournoi m'a été très bénéfique. J'ai pu jouer, dans les qualifications, de talentueuses jeunes joueuses hong kongaise qu'on va bientôt retrouver dans le top 100. Humainement c'était également très riche j'ai eu la chance de rencontrer des personnes adorables dont ma famille d'accueil. C'est tellement important à mes yeux d'être bien entourée et soutenue. Sortant tout juste d'une période intense et fatigante d'examens, couplés aux précédent wsa, je suis contente du niveau de jeu que j'ai produit. Le bilan de ce tournoi et plus globalement du mois de mai est positif. Après un début d'année compliquée, les wsa d'avril m'ont bien relancés et permis de monter en puissance pour ceux de mai. Je suis au milieu d'une longue série de tournois, avec à venir le tournoi de Bucarest et celui des Pyramides sans oublier les play-off. It was Abdulla that took a relatively comfortable 2 - 0 lead with game scores of 11-5 and 11-8 but James rallied back well and went 8-4 up in the 3rd. Abdullah dug deep and returned the score to 10 all and with James saving 1 match ball he managed to secure the 3rd game 13-11. James continued to apply excellent pressure and took the 4th game 11-7 and went to a 9-4 lead in the 5th game to a visibly mentally tired Abdulla and eventually James took the 5th game 11-7. The second round men’s match-up pitted 83rd ranked Tayyab Aslam of Pakistan with 77th ranked Briton Ben Coleman. In what was a highly spirited 62 minute contest Aslam emerged 3-1 victor over Coleman who seemed to be on the end of some difficult, early decisions against him. Coleman’s frustration unfortunately carried into game 2 - yet in spite of this he did well to keep within striking distance of Aslam throughout. Taking nothing away from Aslam who’s speed, agility and shot execution kept the pressure on Coleman and saw Aslam take game 2, 11-8. Coleman’s focus in game three was evident from the start storming out to a 4-0 lead before Aslam managed to get on the scorecard. Coleman looked to find his stride pushing through game 3 by a score of 11-5 with some deft retrieving and a short game that Aslam - despite his speed - had no answer to. Coleman looked to have found his stride going into Game 4 as he looked to take the match into a fifth and deciding game. Similar to the first three games each player looked equally matched and to the credit of both players did well to play through some congestion in the middle of the court. Unfortunately both players felt hard done by with more contentious calls and Coleman leaving the court once more to express his frustration. Coleman kept it close and pushed game 4 into a tie break at 10-10 before Aslam played an unanswerable nick to take him to match ball. Unfortunately match point was decided by a stroke being given which perhaps unfortunately seemed consistent with the officiating throughout. After the match both players were very complimentary of their opponent and remained reserved in commenting on the officiating - a testament to the professionalism of both these players. The HKFC Meco International 25 Mens and Women’s event kicked of today with a major upset in the women’s qualifying draw. Cheng Nga Ching (unranked) from Hong Kong beat Zulhijjah Binti Azan (WR75) from Malaysia in 3 straights sets in just 17mins. Azan who has recently suffered a motorcycle accident commented " I thought I was fit to play but once on court that was obviously not the case" Azan was still scarred with visible lacerations on her hand. Ching will go onto play Choi Uen Shan in the 2nd round of the qualification draw tomorrow night to secure a place in the main draw. On the first day of the qualifying round for the WSA event at the Hong Kong Football Club, Chloe Mesic (France) ranked 83 faced local under 15 champion and rising star Lui Hiu Lam. 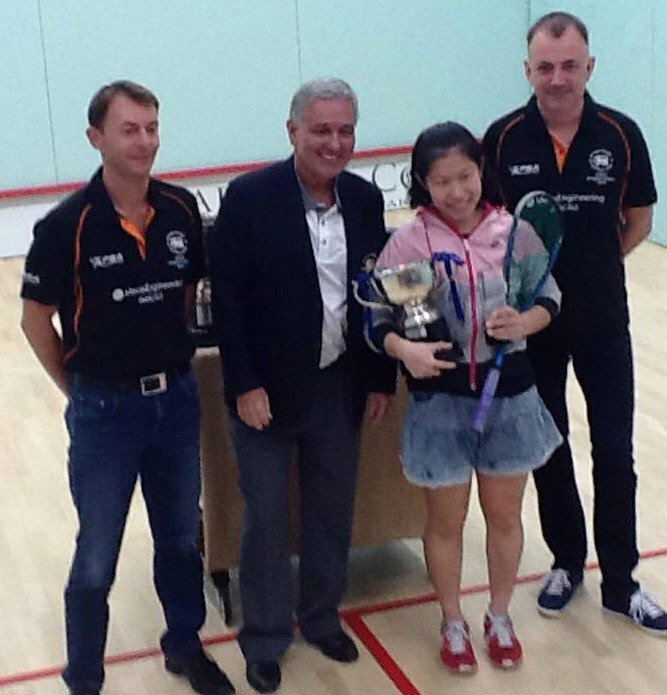 Local Diocesan Girls student and current Hong Kong under 15 champion Lui Hiu Lam faced Chloe Mesic (France) in a thrilling match which saw Chloe win in 4. Twenty three year old Chloe, an Engineering student from Lyon and currently ranked 83, came to Hong Kong immediately following her last University exam hoping to move past the qualifying stage. During the first game Chloe dominated the front of the court while Lui Hiu Lam played unforced errors and lost 7/11. 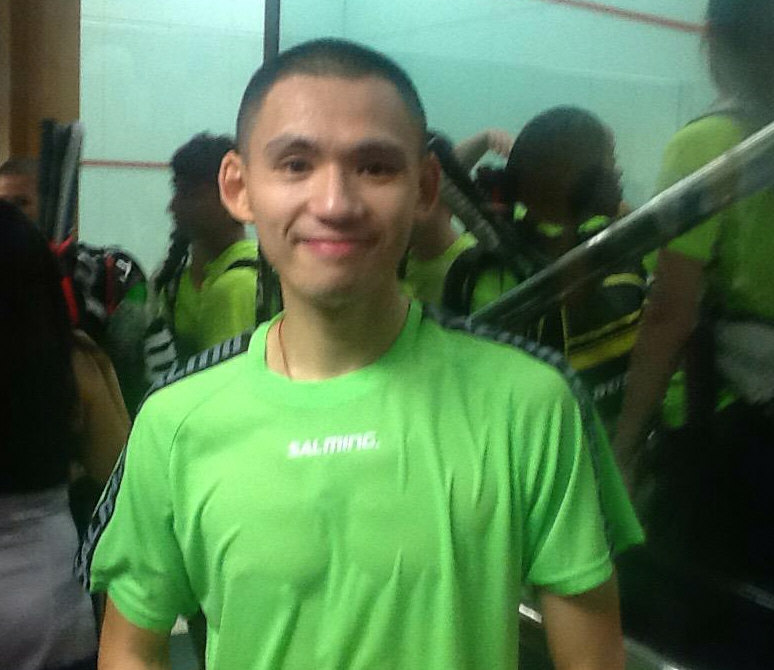 Lui Hiu Lam, came back fighting showing strength, determination and accuracy to clinch the second game 11/9. However, Chloe’s agility, persistence and patience saw her take out the third game 11-4 which was followed by a decisive 11-2 final game. 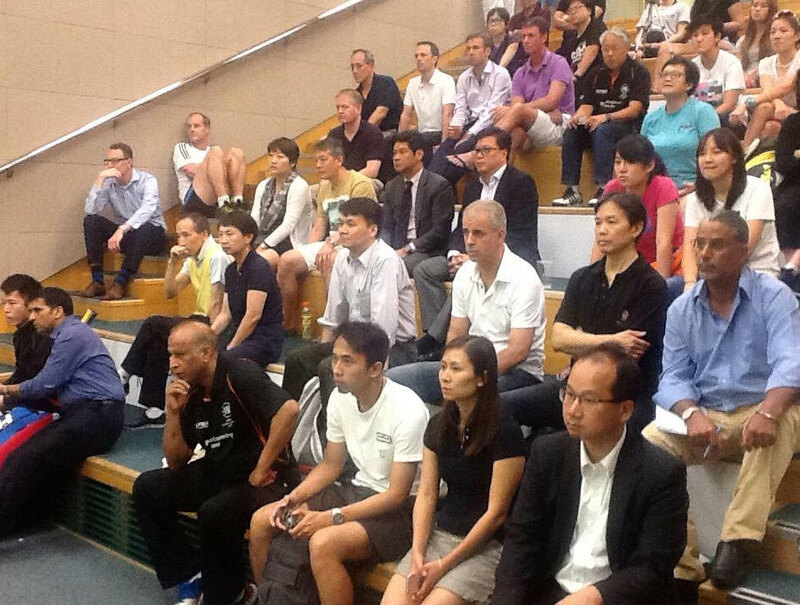 Chloe commented on the accuracy and skillfulness of her opponent including the style of squash played by the Hong Kong junior which is very different to what she is used to in Europe. Chloe’s next match is 5pm Tuesday as she continues on her quest for a top 50 ranking. Local HKFC under 10 champion Alyssa Ho was most impressed by the strength of Chloe’s volleys while fellow under 10 player Rachel Sheary was amazed by how hard both players hit the ball including the strength of their return of serve.